Product #22058 | SKU NE8FDV-YK | 0.0 (no ratings yet) Thanks for your rating! 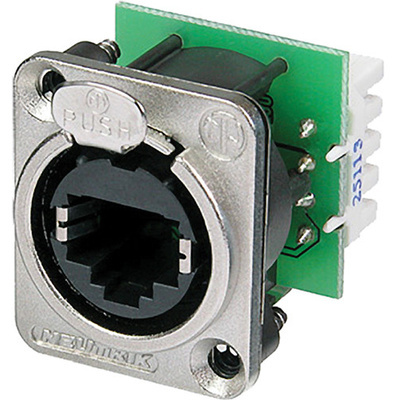 Neutrik's EtherCON Series Panel Mount Receptacle has IDC punch down terminals, D-sized metal flange with latch lock, maximum panel thickness of 4 mm, and comes with mounting screws. The etherCON Series is a ruggadized and lockable RJ45 connector system, optimized for proaudio, video and lightning network applications. The chassis connectors are shaped to fit into standardized panels out of the entertainment industry. The D-Series offers the most rugged design of the etherCON series and is perfectly suitable for panel mount and the installer market.